Can you provide more info on the pulse widths and time data? Any more info would be useful. Thanks. Input to the LMD circuit was 10v peak to peak square wave at 50% duty cycle. The output pulse width was about .5ms. The pulse width remained constant as higher frequencies were reached, but the pulse repetition rate and spectral density increased. The inductance and capacitance values were within very tight margins of each other (+- 5% max). I was pretty bummed because I have made several attempts to recreate this circuit and I couldn't seem to get one wire transmission or any other Tesla coil effects. I tried using multiple types of amps, with and without resistors (to meet impedance requirements for the amps), and it didn't produce the expected results either. Any insight from Eric would be awesome. Last edited by Ajay; 09-20-2017 at 03:04 AM. Only now appreciating what you had passed on with respect to the vacuum tunes. I was perhaps the only one to benefit from that information but surely do appreciate as I was the only one I know of that had built most of your tube designs. You gave information that others would not appreciate as it is an entirely different world working with the tubes and the aether. Will advise as we progress as I have been absent from the bench just like you and finally getting back to where we belong. Is California about to be hit by the ‘Big One?’ Fears of a massive quake are rising after 134 mini-tremors rattled the San Andreas fault area just this past week. Seventeen of the earthquakes were stronger than a 2.5, six of them were stronger than a 3.0, and the largest quake was a magnitude 4.6. Any comments from Eric at this point? I am assuming he is listening to what is going on here on his 'wires'. The Cosmic Ray Detector (CRD) is not hearing anything out of the ordinary but is most difficult to monitor and requires a digital recording input which I can set up here but just too busy with the Tubes and making rain. Page 8 is particularly helpful. 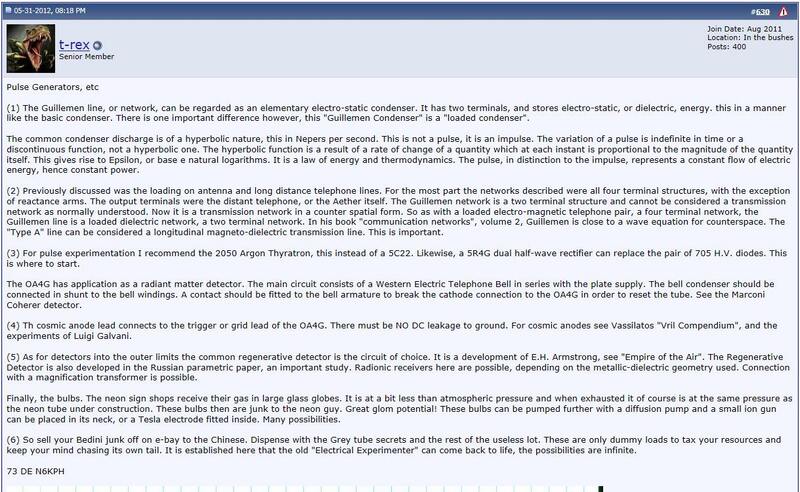 Describing the difference between Magnetism and Dielectricty and in such that between TEM and LMD. 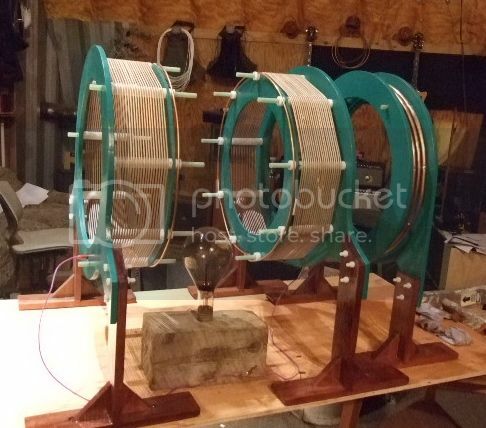 Have built two 12au7a amplifiers for the 120 degree phase shift required for the rotating field for the Tetrahedral Energy Generator (TEG) and hope to get fully back into the Lab shortly. The amplifiers are a Pulse Amp plus delay multivibrator and gives a variable delay from 3 to 300 microseconds and ideal for the 120 degree phase shift required. This is what 'Bruce TPU' was seeking but probably never realised. Has taken me 3 years to get to this point and was going to use the AD-YU Radar variable delays but feel this the better option. LIVE CONFERENCE CALL WITH ERIC DOLLARD - FREE TO JOIN - TOMORROW FEB 18 SUNDAY, 11AM PACIFIC STANDARD TIME. We'll make announcements, Eric will share what he has been working on lately and we'll open up for questions about anything he has written or presented on. Adrian, that's a beautiful lab setup and though I have only started reading the writeups your experiments look fascinating. 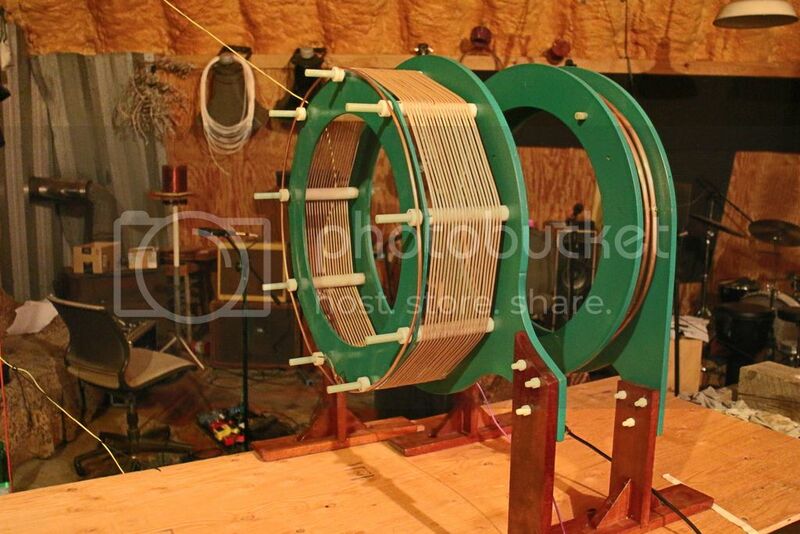 Some recent works with resonant transformers built for Eric's Cosmic Induction Generator. 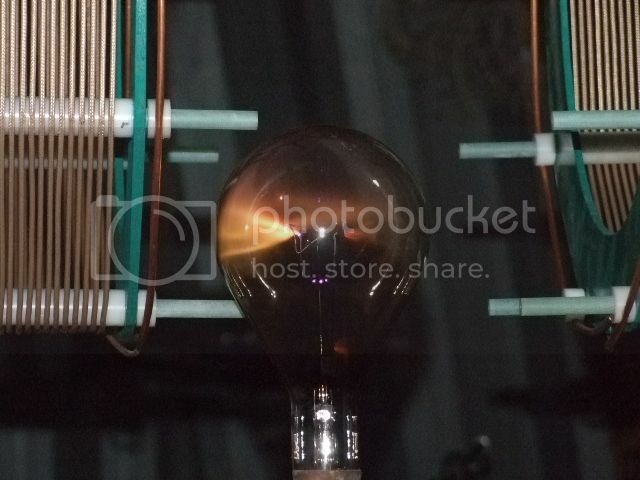 First series: The center field between the two conjugate wound transformer secondaries is AM modulated, exposed to a burnt out 500 watt bulb creating the Aurora plasma mist. About 150 watts excitation at 1900 kHz. Second series: Single transformer, AM modulated musical plasma discharge. Bach on a spark. Description below. Video below: Music from a plasma discharge. There is NO speaker in this video projecting the sound. The sound is being projected from the plasma arc discharge displacing the air as it pulsates to the audio frequiencies. The arc is being generated by an amplitude modulated radio frequency signal (1900KHZ) from a radio transmitter at a power level of approximently 400 watts. 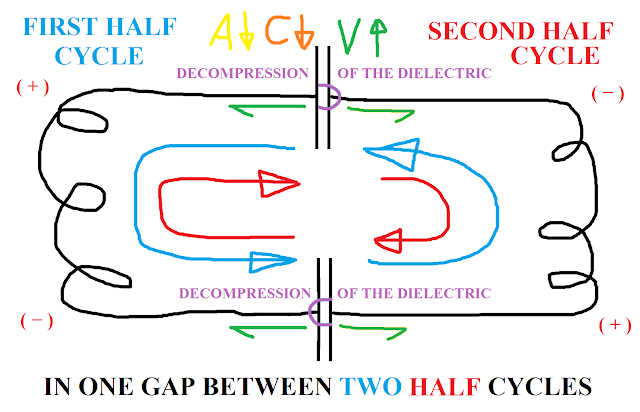 The device shown creating the arc is a quarter wave resonant transformer (Telsa Coil) in telluric mode with the lower terminal of the transformer's secondary connected to earth. Design form factor is by Eric Dollard N6KPH and proportioned and fabricated by Bruce Gavin KD1MW. Recording of video and audio was done with a Canon EOS M camera. Only the built in microphone of the camera was used to record the sound. Note the sharp pointed tips from the plasma brush discharge when the camera finally focuses. This is an organic shape that can be found in many natural conditions. Audio chain was limited to just the narrow bandwidth of the Yaesu FT990's AM passband. The bright light that appeared for a moment was a small florescent tube reacting to the high magneto dielectric field surrounding the plasma discharge. Last edited by Macak; 06-24-2018 at 03:48 PM. Neither of the videos seem to play. The abbreviated youtu.be versions won't work. I embedded these into my next 2 posts. Last edited by Aaron; 06-24-2018 at 12:39 AM. Probably the cleanest, polished, fantastically engineered and most extensive analysis on these types of systems I’ve ever seen undertaken thus far. Credit to you Adrian. 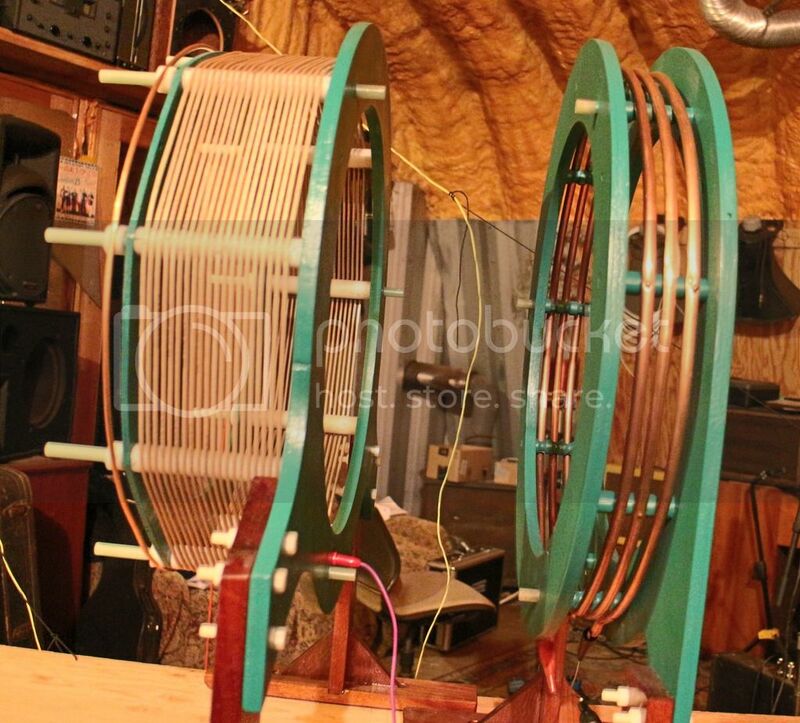 [QUOTE=Macak;311368]Some recent works with resonant transformers built for Eric's Cosmic Induction Generator. Lovely coils Macak. – Do you live in some kind of cave or underground? Wow indeed. Looking forward to watching the videos when I get home! Please do introduce yourself to Eric and I at the conference. I want to show him some pictures on your website so he knows the amazing work you're doing. Would like to learn more! Macak, this is exciting! Great to see a conversation turn into this! Saw your email - just been swamped. I hope everyone enjoyed the conference. Will someone post a writeup for those of us who could not attend? For those of you who were watching the Thai cave rescule -- and Eric, if he is still at Aaron's and near a computer -- it is perhaps of interest that a telluric radio system was used to communicate with the team underground. The letter on Eric’s recent presentation page has been changed. We were waiting for this report and only just now have it available. Whether you have this presentation or not, READ THIS!! If that doesn’t make you concerned about what the grid has become, then nothing will. There used to be an affiliate link we could use to send a (larger?) % of the book proceeds to Eric. I think it was if you ordered via ericpdollard.com ... however I am not seeing any affiliate links there. What's the correct link we should be using to order? You can use any of the links in the thread. In addition to the normal royalty that Eric receives, I'm putting in extra from the sales of the vids to pay off the entire building by the end of next month so Eric and EPD Laboratories, Inc. will receive benefit no matter what. For some reason Clickbank is not accepting my payment / not letting me check out. Perhaps it is because I am abroad, or perhaps it is "nem". I see in the Cryptocurrency Marketplace here that you accept payments via Bitcoin for all eMediaPress products, and Bitcoin payments -- in addition to reducing portly central bankers to puddles of gibbering hate -- are more difficult to "interfere with". How can we pay via Bitcoin? If anyone else has been having issues with Clickbank, here is another way. EDIT: Aaron suggests this may not be in working order anymore. See below for updates. You can pay direct to paypal if needed - paypal email is: shop at emediapress dot com - can send total listed on the website and follow up with a note about what you are making payment for. You'll receive the download links by email then. I have to verify the info for the crypto. I already bought some Bitcoin for this, so I will wait for you to confirm the cryptocurrency details. I have edited the original post to reflect that the cryptocurrency payment information may not be current. Please send me an email info at emediapress dot com and I'll give payment info for bitcoin. Thank you. I like this simulation since it uses twelve capacitors in its LMD modules hinting at a parallelism with the Tesla story/myth of a 1931 Pierce-Arrow conversion into an A/C motored EV which had used twelve (radio) tubes may have, instead, been twelve vacuum tube capacitors? Last edited by Vinyasi; 08-23-2018 at 05:15 PM. Reason: Reduced impedance by adding a shunt resistor between the inductive loads. Shorting the two pairs of loads to each other also helps. Glom obtained for a new RF generator and complete rig. An old mass spec has been gutted leaving the frame, RF housing and compartments which have been cleaned or repainted as appropriate. My (old) parallel 807 tube RF generator has been mounted onto the MS frame which will be used to power the next (high power) RF generator stage. This high power RF gen consists of a +2KVA transformer that produces 4kV at 750mA. Once rectified and filtered by large capacitors and choke gives a plate DC voltage of almost 6kV. The RF tube supplied is a 3CX1500D3 with the appropriate socket, housing, chimney, and large blower fan. – This has been restored and is operational. The old MS plasma circuit used a Colpitts Oscillator with this tube, but I am attempting to change the circuit to a “grounded grid” system, driven by the dual 807’s which should produce the 75-100 watts needed to drive the grounded grid stage. (The 807 stage feeds through the grounded grid to provide additional RF power). The top of the MS frame will hold a top deck which will have the Tesla Coils mounted on the top in various configurations, with the RF power fed in from below, (either low or high power). The whole contraption is on wheels so it can be moved about, transported or just moved out of the way. “Grounded grid” as the input RF fed into the cathode, generally via the filament heater supply which is kept isolated from “RF ground” via a large bifilar wound RF choke, but the DC circuit is maintained via the centre tap of the Filament transformer (6.3v @ 25amps). – This part is also completed. The next stage is to complete the input circuit, which requires a pi, L or impedance matching network with (Q4) to provide an impedance match between the 807’s drive and the input of the grounded grid. Then the output circuit from the tube to complete but has already been partly assembled. Explanation of Parametric Oscillations in Eric Dollard’s LMD Analog Computer. The synthesis of electrical energy is made more likely using Eric Dollard's analog computer in LMD mode: Longitudinal Magneto-Dielectric. This video attempts to explain the mechanics of how this subcircuit can parametrically amplify power -- mostly resulting in voltage dominating over current. This is achieved through the use of a pair of caps and a pair of coils with impedance matching. Infinity and Maya blend in electricity. We don't know it yet for our collective awareness is largely unconsciously avoiding knowledge and recognition of the gap between the Absolute and the Relative which I know to be Dharma, itself. This gap has a bidirectional interplay in which the Absolute is forever tugging on the Relative to transcend while the Relative is constantly tugging on the Absolute to manifest itself. 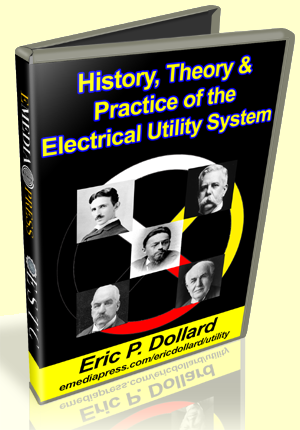 Eric Dollard quantifies this dual nature of Dharma by calling it the synthesis versus the decomposition of electrical energy. But mechanical energy can just as easily undergo parametric excitation since electrodynamics, at a fundamental level, is largely mechanical in nature. The concern, among traditionalists, that energy cannot be created nor can it be destroyed have never transcended. For if they have, and become more familiar with it, their minds would accept the notion that Maya is a game in which the goal to satisfy the senses and material mentality is to deny God, deny Infinity, and relegate everything to finite quantities which can be countable. Yet, cardinal number sets in Mathematics, allows for the countability of Infinity and designates the first letter of the Hebrew alphabet, Aleph, as the symbol for each unique identity of infinite caliber. This is the game of Maya: to make countable the non-measurable Infinite. It is this interface between Maya and the Absolute which electricity partakes of making the synthesis and decomposition of energy possible since 'free energy' does not go anywhere nor does it come from anywhere else. It comes from energy already in existence. It comes from itself and returns to itself. This is how energy manifests and transcends. The scientists don't know this yet (some do) since corporate and consumer materialism rules our collective consciousness along with all of the limitations which are automatic to materialism, such as: limitations. Karma is a limitation. And Charlie Lutes would always equate - for all practical purposes - karma with consciousness. So, it's not everyone's karma to grapple with the exclusion within the Conservation of Energy (within the human endeavor of physics) put forward by Emmy Noether which both defines Conservation of Energy using time as an absolute (non-varying) reference frame, yet also allows for the exemption of energy from this law when time is not steady.